The Life and Adventures of Calamity Jane by Herself is as wild and outlandish as the author herself, offering a unique perspective into a woman who lived her life outside of the conventions of her time. Famous during her life, Calamity Jane became larger than life after her death in 1903 and her legend lives on through contemporary media, including in the 2013 novel In Calamity’s Wake by Natalee Caple, and as a character on the popular HBO series Deadwood. One of the most colourful characters of the Wild West, Calamity Jane was an American frontier scout best known for her associations with Wild Bill Hickok and Buffalo Bill. Born Martha Jane Canary in May 1852, she was the eldest of six children, and was charged with providing for her family following the death of her parents. After working as a waitress, an ox-cart driver, and a dancehall girl, Jane eventually found employment as a frontier scout at Fort Russell, Wyoming. She was an excellent shot and a skilled rider, but her bold nature and taste for trouble lent to her reputation for rough-riding and gun-slinging. During the 1876 Gold Rush Jane settled in Deadwood, South Dakota, where she met the legendary gunfighter and stagecoach driver Wild Bill Hickok, eventually appearing in Buffalo Bill’s Wild West Show as a storyteller and trick-rider. A mainstay of popular culture and mythology, a character based on Calamity Jane can be seen among others in Deadwood, the David Milch-produced western that aired to great acclaim on HBO, and in a film entitled Calamity Jane starring Doris Day and Howard Keel (of Dallas fame). 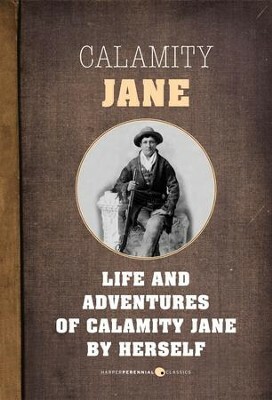 Jane’s autobiography, The Life and Adventures of Calamity Jane by Herself, was likely ghostwritten, as Jane was believed to be functionally illiterate. Calamity Jane died in 1903. I'm the author/artist and I want to review The Life and Adventures of Calamity Jane: A Short Memoir - eBook.